Sure it's the dream of many dogs to run wild in the streets. What pup wouldn't want to scurry throughout their neighborhood unsupervised and without their pesky leash? We hate to break it to you, Fido. That's not going to happen. Need a space outdoor just for your dog to play? Consider building her a dog run - a fenced in, locked area of the yard where your dog can, well, be a dog. Dog runs provide pooches the best of both worlds: protection and the freedom to run in their own space. We all know that most dogs love to be outside. That's where they do their business, exercise, sniff around, take naps, and just basically enjoy being outside. Sure you can go cruise the Internet or the aisles of your local pet store in search of a dog run. But if you're looking for a fun, outdoor project that can be done with the help of family members and friends, building one might be just for you. Before you get started, find spot in preferably in the back yard to place the run. It needs to be a place that's at least partially in the shade during the hot summer months, clear of poisonous plants and flowers and visible enough for you to put your eyes on your pet from the window. Next, measure the space and clear the area. The size of area depends on your dog. Bigger dogs need more room to romp around and even sprint. 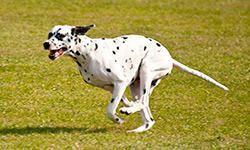 Dog runs can be long or square depending on the size of your yard. And keep this key fact in mind when building: if you think your dog might be able to clear the fence, you might think about putting a top on the run. With a digger or shovel, dig the holes for your fence posts (it's recommend that you dig eighteen inches to 2 feet deep if you are using a standard 5 feet tall fence). Once the holes are dug, put the posts in them and place concrete around them for extra support. Now add the fence by running chain-link fencing from one post to another and then hang the gate. Be sure to triple check to make sure your dog cannot open the gate by pushing against it. Don't assume that can't happen. If your dog is a digger - and most dogs are, - either bury the bottom of the chain link fence at least eighteen inches or lay chicken wire along the perimeter line of the fence so she can't dig below the fence. Lining the edge of your fence with bricks or huge stones will weigh down the chicken wire (make sure the wire isn't exposed) and add to the appeal of your dog run and your backyard. Make sure she has her water and her favorite toys in with her and get ready to host the dog run open house!